This review has not yet been approved by the owner of this writing service. If you are the webmaster of Qualityresearchpaper.com, please Contact Us to approve or remove this review. 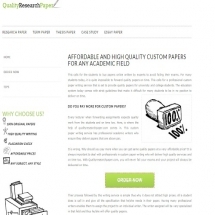 QualityResearchPaper.com is a little more than a subsidiary of another writing service – the only functional link on the website leads to the order form of EssaysCapital.com. This website is quite decent, well-designed and easy to use, while QualityResearchPaper.com is essentially empty. Prices are a bit higher than average, but nothing out of the ordinary, ranging from $18.03 to $47.80 per page (275 words). Cost depends on several factors, the most important one being the proximity of deadline, which may be as close as 3 hours or as far off as 10 days. There are three quality levels: Standard, Premium and Platinum, which also influence the price, but this influence is mostly rather insignificant. Peculiarly, academic level of assignments doesn’t influence the price at all. Support is available via phone and live chat. Either way, operators respond to your queries almost immediately and are extremely quick in answering your questions and assisting you. Judging by the samples available on the website, the quality of writing provided by the service’s employees is mostly satisfactory. There are no blatant grammar, spelling or syntax errors, facts seem to be in order, logical connections appear to be sound. However, there is nothing especially impressive about them. Refunds must be requested within 3 days after receiving the paper. QualityResearchPaper.com is a subsidiary or a satellite of EssaysCapital.com – a decent, even if not exactly extraordinary, writing service. Customer support is efficient and helpful; quality of writing is not bad; there are a lot of additional options to tweak your order to your liking. Prices could have been lower, but you cannot have everything at once.